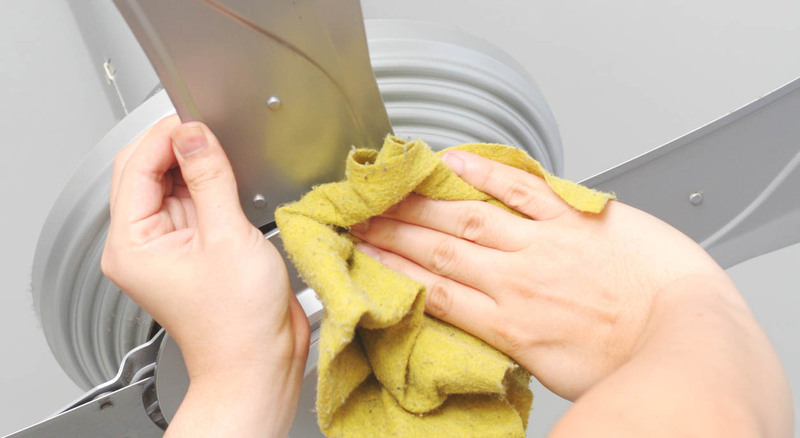 How to clean ceiling fans may not be a question high on your priority list. The fans are so high up on the ceiling, and when the blades are spinning, no one can tell anyway, right? The truth, however, is that the blades are probably coated in a bunch of dust, grease, and other gunk you really don’t want hanging over your head—literally or figuratively. As onerous as the task may seem, it’s really not that difficult to clean your ceiling fans if you know what you’re doing. Here are some tips and tricks that will have your ceiling fans so clean, you may feel compelled to turn them off when company comes over, just so they’ll be noticed. If you can reach your ceiling fan blades safely with a ladder or step stool, then this is an amazingly simple way to get the job done. All you need is an old pillowcase. Just put the open end of the case over a blade (as if the blade were a pillow) and wipe both the bottom and the top of the blade as you pull the case toward you. All the dust and grime are captured right in the pillowcase. Simple but brilliant, right? You can also spray the pillowcase with a cleaning solution for extra cleansing power. It’s a neat and clean way to scrub without sending dust and grime flying. However, you still may want to wear a mask or handkerchief over your mouth and nose to avoid ingesting any dust. Tip: Don’t forget to empty the dust from the pillowcase before putting it in your washing machine, or you could wind up with a different kind of mess. If you can’t safely reach your ceiling fans, you’ll need a tool to help you get the job done. A one-armed duster ($10.99, amazon.com) that extends several feet high will allow you to reach those grimy blades without having to stand on an unsteady ladder. Want to make your job even easier? Look for a duster with a hole in the middle that lets you slide it right over the blades so both the top and bottom get cleaned at once. This will send some dust dropping below, so make sure you cover any furniture before doing so and wear protective gear over your nose and mouth. If you have a fan in your kitchen, chances are it may be coated with grease in addition to dust and dirt. This makes the job a bit more challenging, but not impossible. The most thorough way to clean the fan is to remove the blades and wash them individually. All fans are different, but the blades can usually be removed by just taking out a few screws that hold them in place. Once you have removed all of the blades, wash them in your sink with dish soap, dry them with a microfiber cloth, and screw them back into place. If your fan has a light, you can remove the dirty glass covering and wash it the same way. Use a long-arm duster sprayed with a cleaning solution to wipe down blades that are too high to reach.